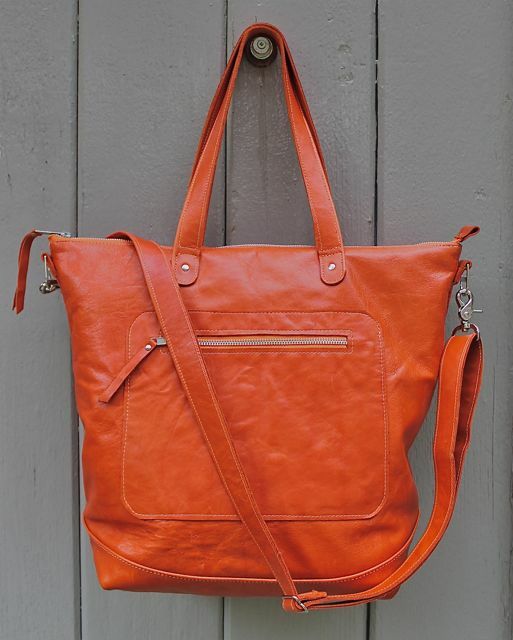 Here is the Grosvenor Tote in pumpkin. 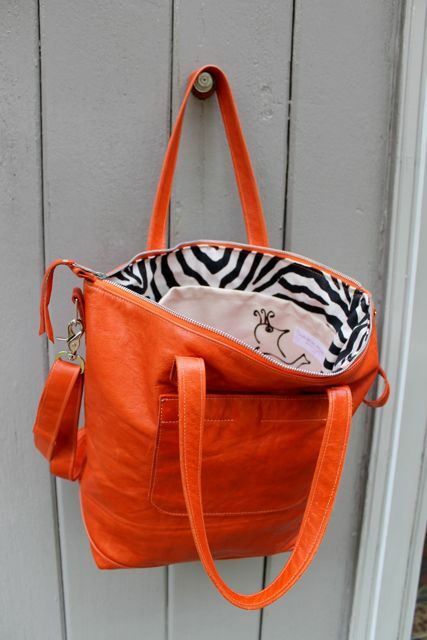 I think there are some essentials in a big tote. 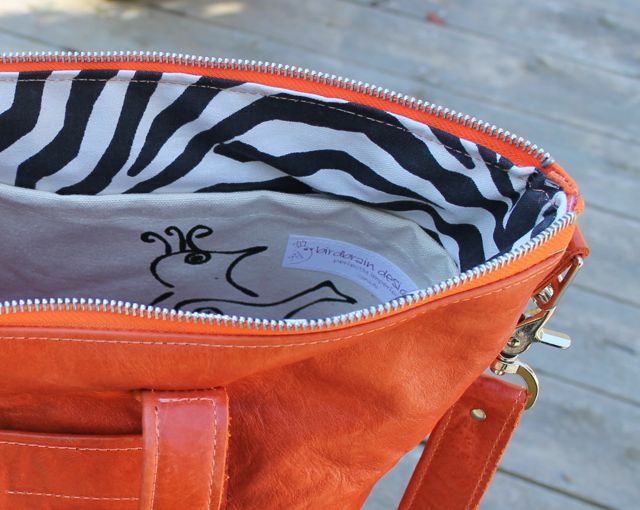 The first is lots of pockets inside and out. 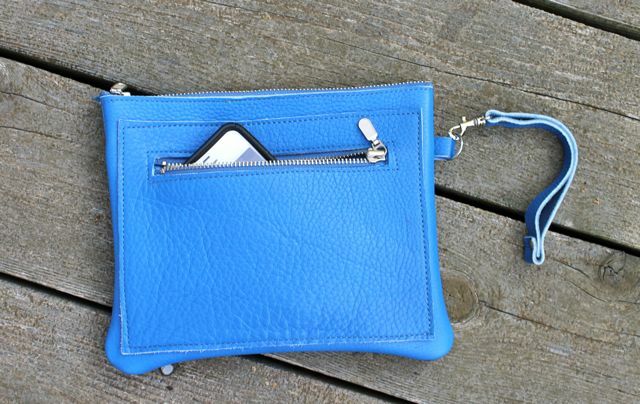 This has secure pockets on the outside, both a big zipper pocket and a smaller magnetic snap pocket for those things you want to find quickly. 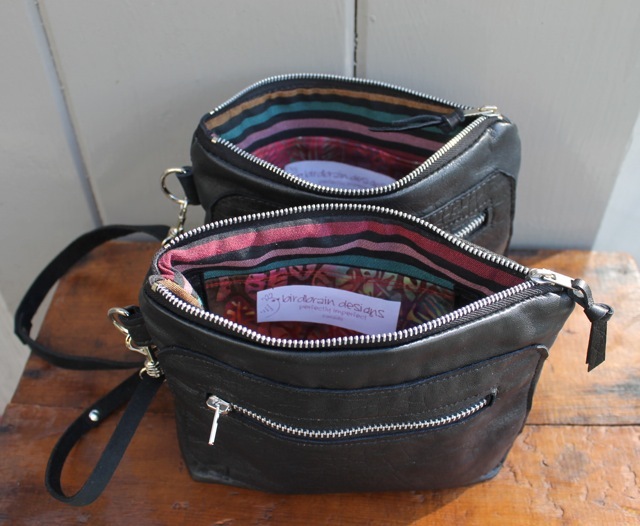 Inside are three pockets. 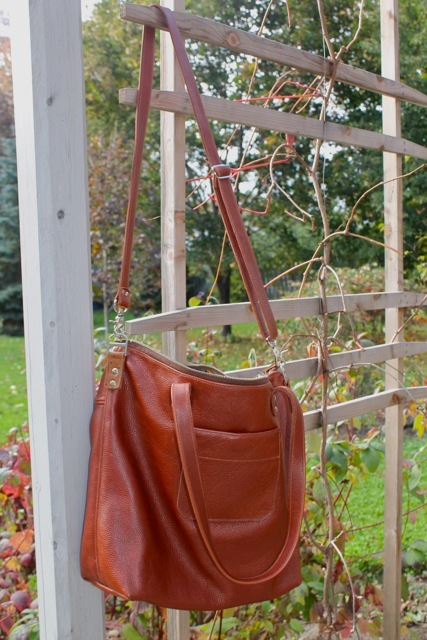 The second essential is a choice for carrying; this has both handles and an adjustable shoulder strap. And finally I want great leather. 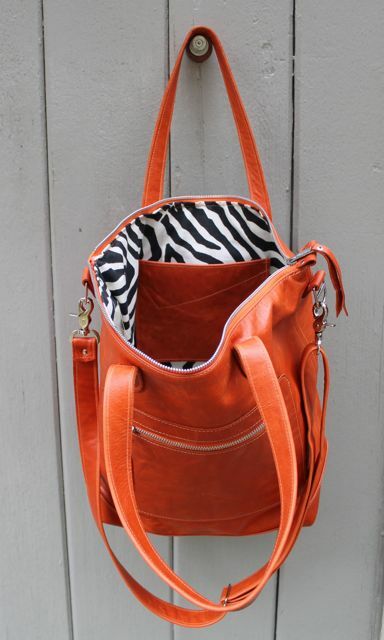 This tote hits the jackpot in this category; it is made of a smooth buttery pumpkin leather. It is 17″ wide, 14″ tall and 6 ” deep. 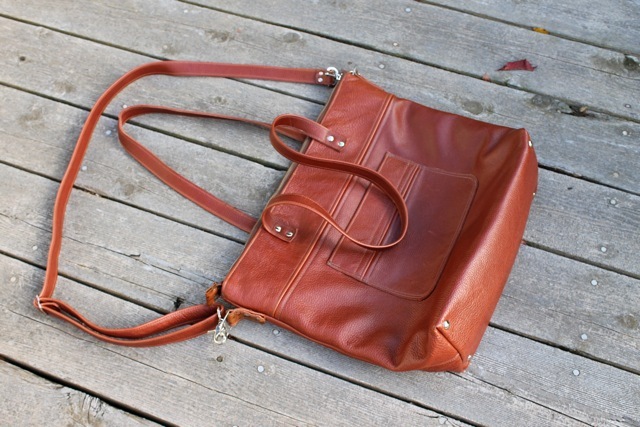 I first designed this bag as a travel tote, but most who have bought one find they want to use it as a daily bag. 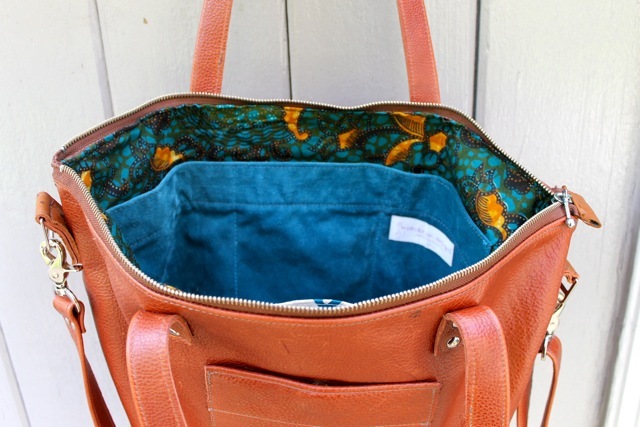 While it is a substantial size, it’s not too big to tote around filled with all those things we find necessary to have with us. For me it’s sketch book, paints, brushes and pencils. All fit nicely in here. 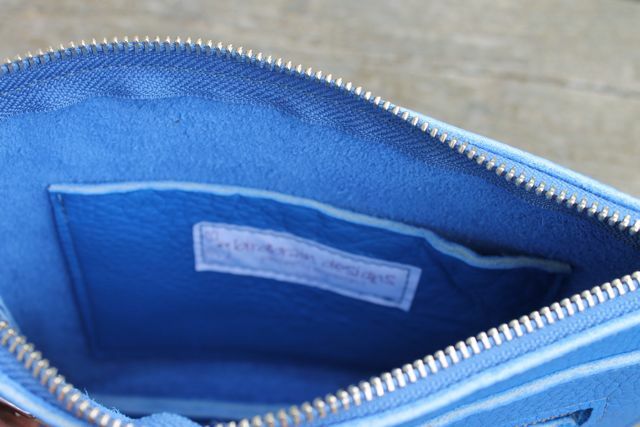 And the triple leather bottom with rivets ensures that the bag is strong enough to manage it all. I was in Toronto recently for the Wearable Art show. It was in a great venue this year on Bathurst and from there I walked to my suppliers for zippers (I never have enough of the right colour or size!) and to my favourite book store. On the way I passed a house I’ve always loved. It’s a little Victorian row house with a great attitude. It was a lovely day and I had time to do a sketch in my new trav.e.logue hand.book. I really like the quality of the paper and the size of the book. I was delighted to find these sketchbooks here in three sizes. I am a bit intimidated by the large size, but may use it in Kenya this January to sketch and tell the story. Yes, I am going back to Kenya, to teach Grade 8 in the mornings and rug hooking at the Community Centre in the afternoons. I’m currently gathering burlap and hooks to take. I’d like to say many thanks to the rug hookers at the Cobourg Hook-in this week who donated their extra hooks. They will be put to very good use. 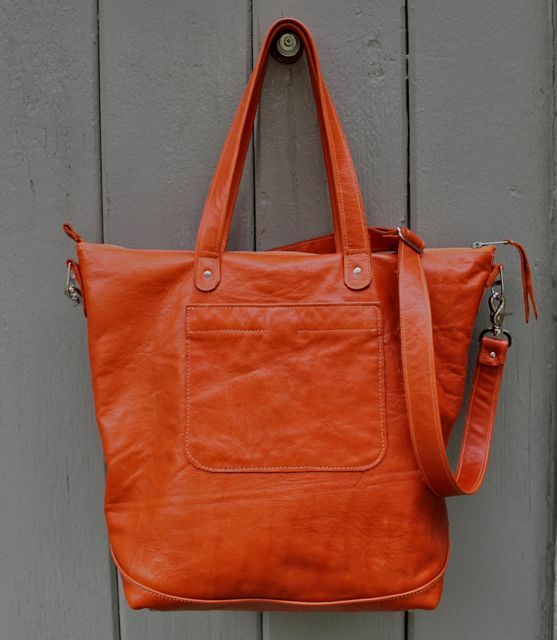 I have been making some new pieces with this beautiful orange leather. It is a joy to work with–buttery and smooth but very substantial, so that it is transforming into great durable totes and bags. This is a Grosvenor Tote lined with the last pieces of my favourite black and white. More pictures tomorrow, I hope. Since they are forecasting some snow tonight, my outdoor photography may be coming to an end. 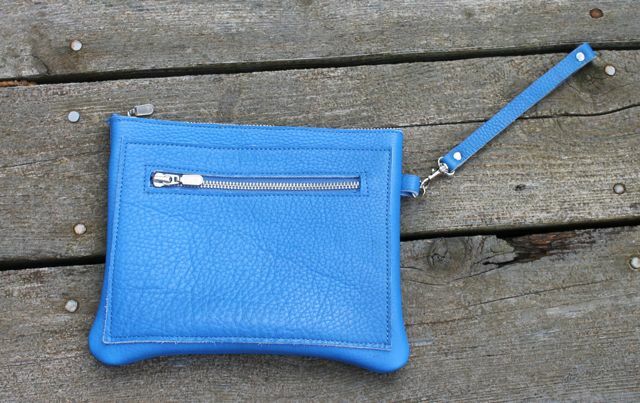 Here is a Friday Pouch in a larger size and an outstanding blue. What a great shot of colour on a cold day. 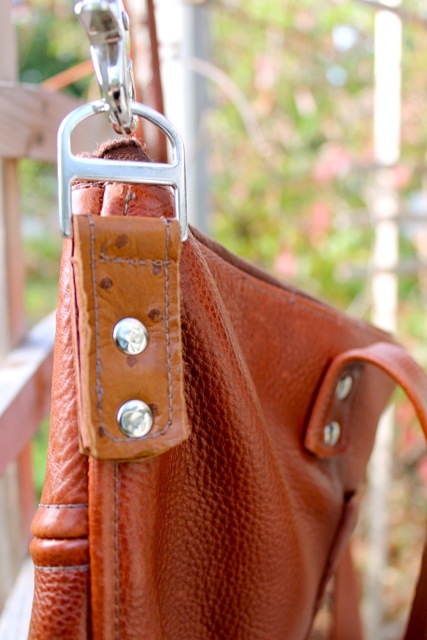 It is made from a remnant piece of durable leather. 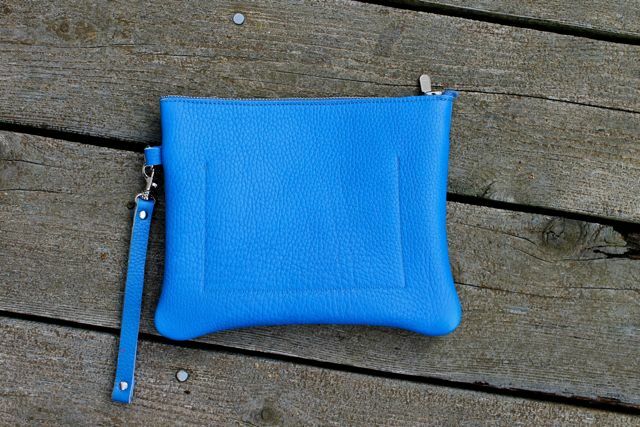 I am hoping that the piece is big enough for another pouch because great colour like this is hard to find. 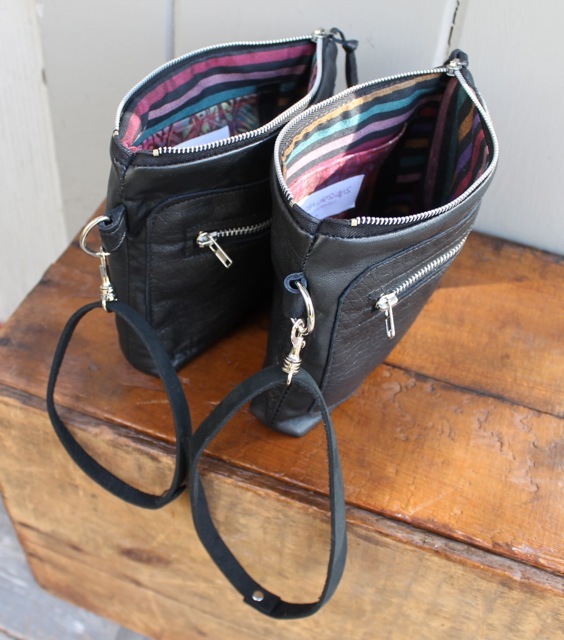 The pouch has an ample zipper pocket on the outside and a slip pocket inside for easy organizing. It also has a removable wrist strap. 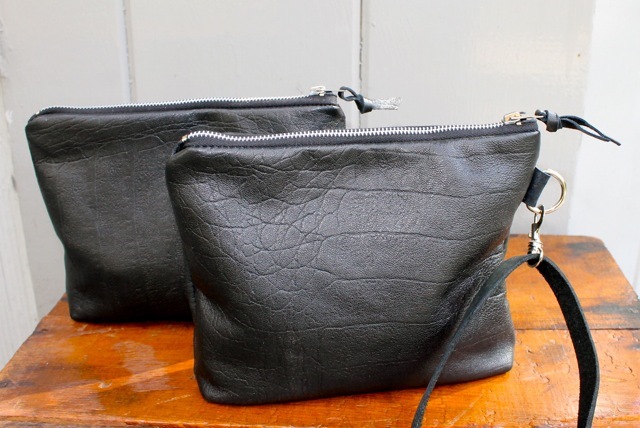 This is the larger version of the Friday pouch — 9″x7″ — so there is room for all you need on a night out but it’s still not too big to slip into another bag. 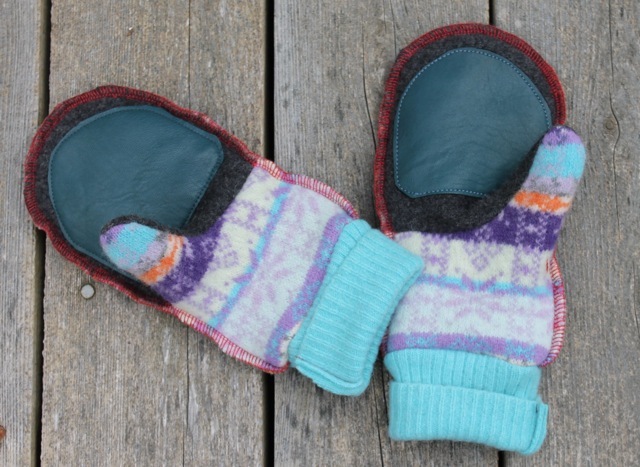 Perfect for sketching or texting, these finger-free gloves keep you warm but don’t keep you from doing what you need to. 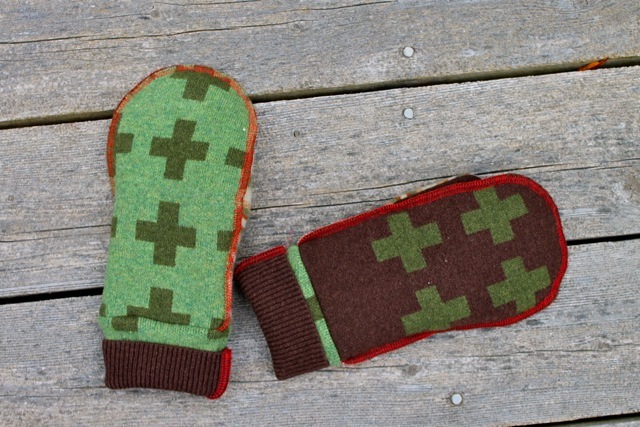 They are shaped to fit snugly and have a cuff which rolls up for extra warmth. 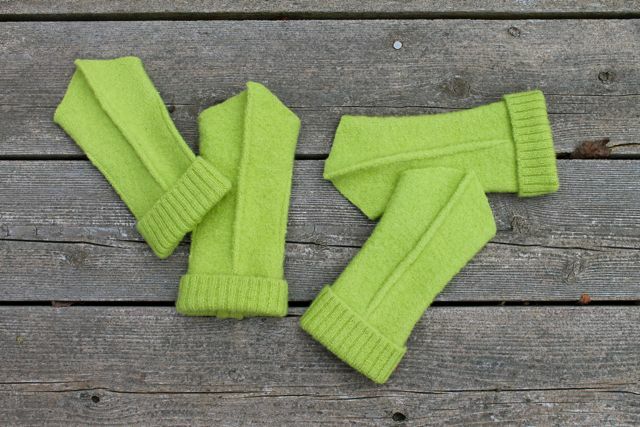 Made from a great sweater, they have a wonderful colour to cheer you on a cold blustery morning. I have been cutting out mitten pieces for the last little while, but since it was -2 this morning, I thought it was time to start assembling. 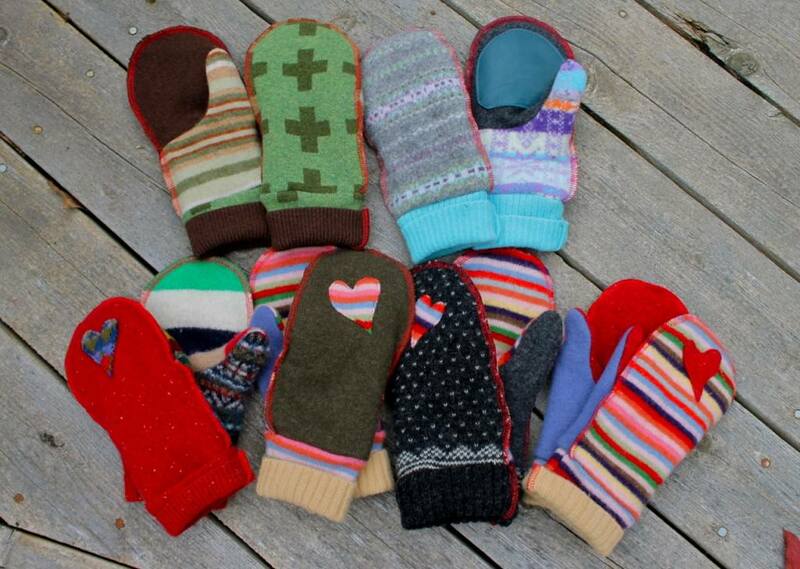 These mittens are made from recycled wool sweaters and lined with recycled wool or cashmere scarves so they are doubly cozy. On the left is my own pair which I was wearing this morning. This is their third winter. The sweaters have great graphic designs and I am experimenting with adding leather and sheepskin on some of them. Below is the first sample with leather palms. And below that is a pair where the original sweater pattern really works. 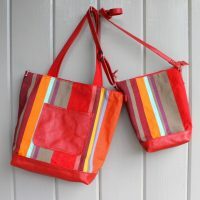 The fun of working with recycled materials is the hunt–you never know what you will find. And when I find something great, I use every square inch of it. 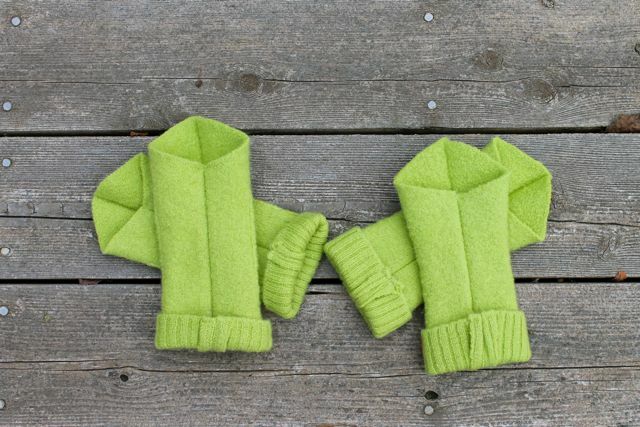 Yesterday I came upon a lime green boiled wool sweater, the perfect weight and colour for finger-free gloves. They are in the works now. 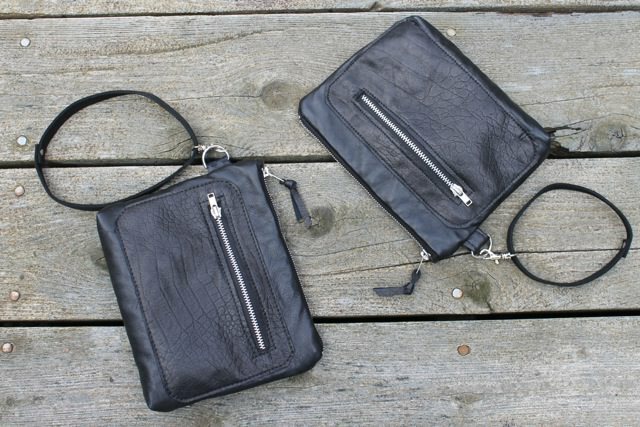 I wanted to make a pouch which could stand well on its own, that is carry all you need for an evening or an afternoon, but fit just as well in your larger bag. I had some pieces of recycled black leather which looked up to the task. 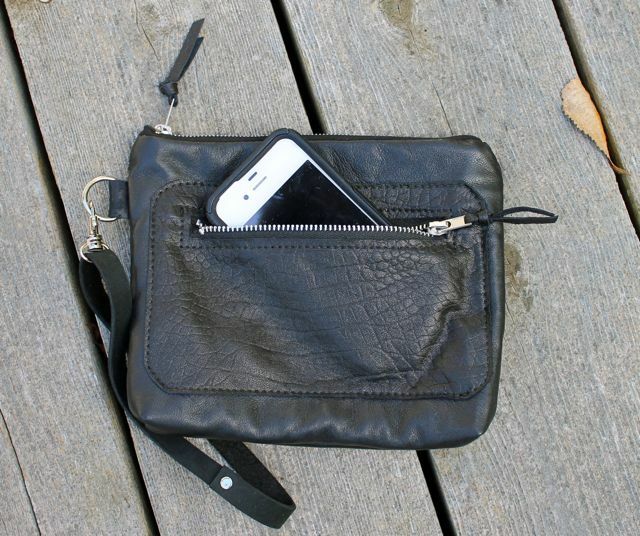 I thought it would need a zippered compartment on the outside which could hold your phone, tickets etc. and a pocket inside. I had a great piece of striped lining from Montreal which has a surface that wipes clean. I combined it with a piece of batik for the pocket. And I attached a loop and clip for a removable strap. Think this one will work in many situations. Plan to make the Friday in some great colours too! Like many other people this week, in the wake of the announcement of the Nobel Prize for Literature, I have been reading Alice Munro stories. First I revisited some of the stories I had in the house and found them even better than I remembered. And then I purchased her new collection, Dear Life. I am midway through this volume and find these new stories as heart-stopping as ever. Yesterday I was driving home from Kingston when the CBC replayed a 1996 conversation between Peter Gzowski, legendary CBC host, and Alice Munro. I highly recommend you listen to it. 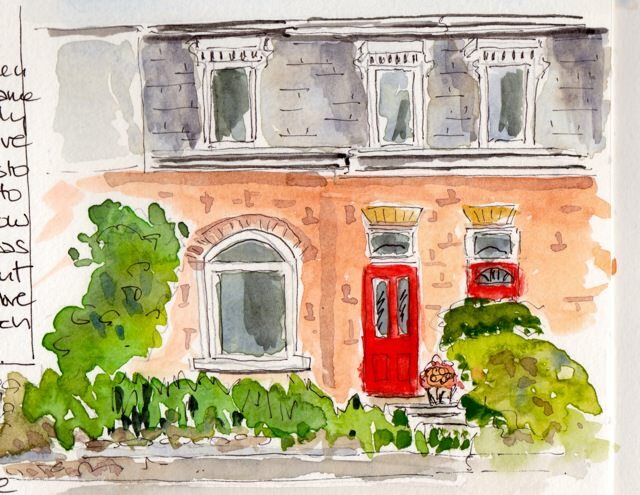 I was riveted–so when I came to Napanee where I had an errand to run, I stayed in the car, pulled out my sketchbook and paints and began sketching this building on the main street while I listened. 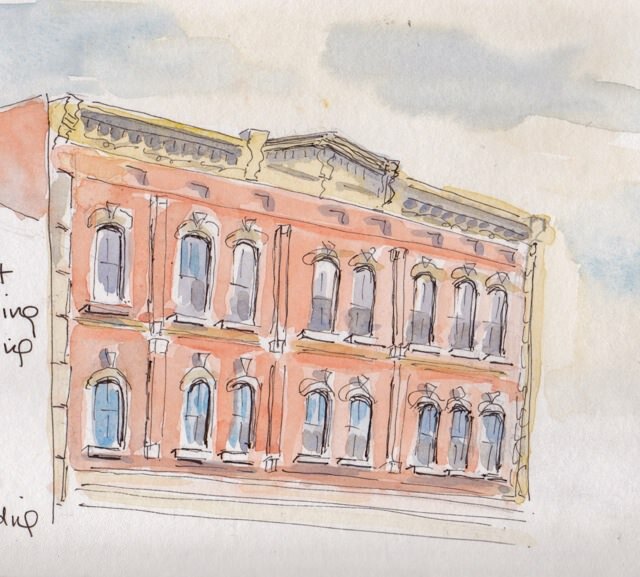 I cannot think of a better way to spend 40 minutes–listening to two Canadian icons clearly enjoying each other’s conversation and sketching a lovely old piece of Eastern Ontario architecture. The New Yorker came today and I see that they too have a reprise of an earlier Munro piece–her story published there first in 1999, The Bear Came Over the Mountain, the story that was the basis for Sarah Polley’s film Away From Her. That will be tonight’s reading. In typical New Yorker fashion, there was no fanfare, no mention of the Nobel, but the photo by Bryan Adams which accompanies the story is of Munro herself. And after all, the New Yorker has been championing Munro for a long long time. ” As … major international retailers grapple with the moral and technical challenges of producing fast fashion in Bangladesh, a movement to change the way people think about what they wear seems to be inching mainstream. Call it Slow Clothing.” (Toronto Star, July 12, 2013). 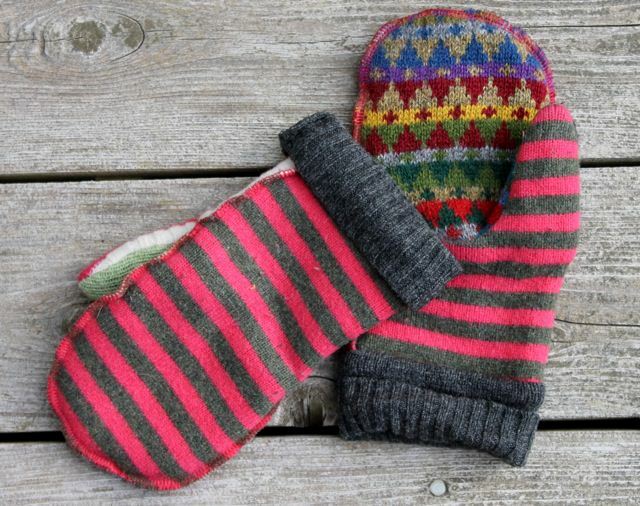 I have been making mittens from recycled sweaters and woollen scarves for some time and it is a slow process, but one I enjoy. 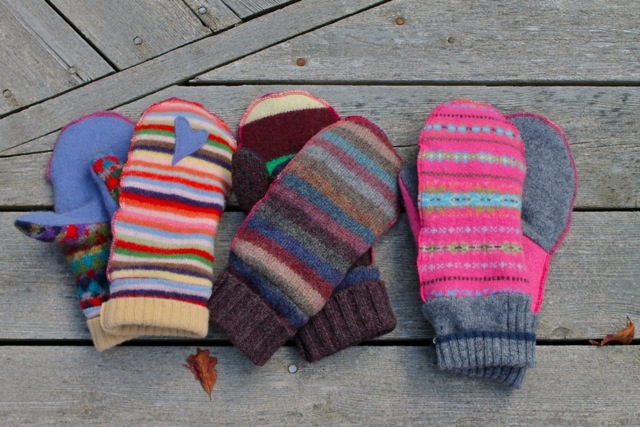 Each pair of mittens is unique. 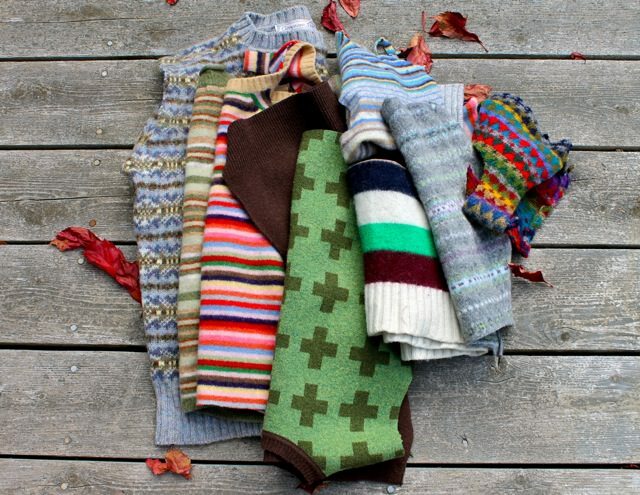 I love combining the colours and patterns — and the quality of the wool you can find in thrift stores, often from Scottish or Italian mills, is much superior to what is available as fast fashion. Much. Combining these pieces to make something beautiful the second time around is, for me, a kind of homage to great design and workmanship. Sporting such apparel makes a fashion statement for sure, but it also makes an ethical one. And it is time.